Founded in Rio de Janeiro, Group Senzala has been in existence for over 40 years. The group is probably the most famous Capoeira group in the world thanks to its many masters and other teachers of Capoeira. First introduced to Great Britain in 1971 by Nestor Capoeira, it did not flourish until 1989, with the arrival of Fernando C.C. Albuquerque (Mestre Gato). Group Senzala’s history begins in 1963 in Rio de Janeiro. Paulo, Rafael and Gilberto Flores, three brothers, originally from Bahia (homeland of Capoeira) had moved to Rio de Janeiro. They began to study Capoeira, during their school vacations, back in Salvador, Bahia. They trained with two of the most famous masters that ever lived, namely Master Bimba and Master Pastinha. Capoeira had become such an important part of their lives that they began to train on a regular basis. Paulo got in touch with other capoeira teachers in Rio de Janeiro and started to lead weekly training sessions in the terrace of their apartment building located at Laranjeiras neighbourhood, in the city of Rio de Janeiro. In 1963, the first of the now famous masters joined the three brothers in practising Capoeira. That master was Fernando C.C. Albuquerque, who was given the Capoeira name, Gato. Gato became friends with Paulo Flores on his return from Bahia, but did not know of Paulos knowledge of Capoeira. One night, whilst at a party, a fight broke out. Paulo become involved. His antagonist tried to front kick him, Paulo dodged the attack and retaliated with a reverse spinning kick, striking his opponent on the temple, knocking him out. After seeing this fight, Gato badgered Paulo to train him, Paulo insisted that he was not a master, or even a teacher, “I am only a student so how can I teach you?”. After days of persistent nagging Paulo agreed to show Gato a few of Capoeira’s basic techniques. Gato began to train with Paulo, his two brothers and some other teenagers at the Laranjeiras. “You learn a few moves and then a few more and then you try to use what you have just learnt, in the roda” Mestre Gato recalls the games he played as very physical and with lots of contact so that he learnt to defend himself quickly. Soon, another joined the group by the name of Claudio Jose Queiroz, followed by his friends Peixinho and Itamar. Two 8 years boys from favela Santa Marta, used to watch and train as well, called Garrincha and Sorriso. After a while Gato brought his younger brother Gil to take part of the sessions. The group was growing. Among the people who joined were, Mosquito, Borracha, Sanfona, Bigode, Jimmy, William and Antero. Gato started to get in touch with other capoeira players in Rio de Janeiro, like Mestre Artur Emidio the main capoeira mestre of Rio de Janeiro at that time. He had some training sessions with some capoeira de Sinhô students and with a formado of Mestre Bimba´s academy called Grande. Capoeira in the early sixties was still quite underground and badly seen by society. The south zone kids, in their search for Capoeira had to go to the suburbs, where most players were of african descent. At the rodas they had to prove themselves, earning the respect of the other players and afterwards they could go for a beer. Although tough the Capoeira environment always had a strong sense of friendship. In 1965 a folk show called Vem Camara performed at Teatro Jovem, Botafogo, Rio de Janeiro. The show was directed by Bira Almeida, called Acordeon, a legend in the world of capoeira and one of the best Mestre Bimba’s students at his time. Acordeon brought in his group some extraordinary capoeiras players like Camisa Roxa, Sacy, Cabeludo, and a young formado from Mestre Bimba´s called Preguica. Paulo and Rafael Flores knew Acordeon from their training at Bimba´s academy and brought their friends to see the show and they all were amazed with such good capoeira. Later Acordeon visited the terrace and taught some movements to that young, thirsty capoeira group. When Acordeon left Rio de Janeiro he lost one of his comrades who decided to stay in Rio, the young Preguica who joined that young group. Finding new premises for the group would cost money. The group set about trying to raise funds by performing at shows. Finally, they were able to rent premises for the group, which now consisted of around 15 core members and about 20 people training occasionally. The group moved into the Largo de Machado in 1966. During 1966, whilst at a demonstration at a German Club, the group introduced themselves as Grupo Senzala. The group became known, moved to new premises and new people joined. In the late 60′s there were very few competitions open to Capoeiristas. In 1964 a tournament called Berimbau de Prata took place in Santa Teresa and a few groups took part in it. The Academia Santana, led by Mestre Valdo Santana, asked Paulo Flores and Gato to represent the academy and they accepted. Surprisingly the young capoeiristas came third after Bonfim’s and Mestre Artur Emidio’s groups. In 1967 another capoeira group competition was organized and supported by an entity called Amigos do Folclore (Friends of Folklore), the Berimbau de Ouro. Each group were required to perform a group demonstration and choose a pair of capoeiristas to play for five minutes. The performances were judged by a committee of masters and folklore experts. The pairs of capoeiristas had a bigger weight in the judgment process. With the help of other capoeiristas like Tabosa and Fritz, both from Brasilia and friends of Claudio Danadinho, the group entered the competition. At the first tournament the team featuring Gato and Preguica won and did so again the following year, helping to establish Group Senzala. At the third tournament, Gato and Preguica were stopped from taking part by the event organization. They were told that the competition was not open to masters, only students. Gato and Preguica protested that they were students, not masters. The association then replied, saying that their results over the past two years had had them recognised as masters. As Gato and Preguica were unable to enter the Berimbau de Ouro they began to train another team from the Group Senzala to enter into the tournament. This new team featured Mosquito and Borracha, who won for a third year in a row. News of this spread throughout Capoeira in Brazil. Many people travelled to see, train and try out this new group of capoeiristas. Due to the groups growing reputation and memberships, they had to relocate again. A student of the group offered the use of a large barn situated on his property which they gratefully accepted and moved into Cosme Velho. During 1968 to 1971 many masters and students travelled to Cosme Veiho and Master Gato recalls it was a “place of great energy”. That location became the meeting point for many years and it was there, where most of that generation of capoeiristas took part in the famous rodas on Saturday evenings. The Senzala group was forged there and it was also where new members of the group got their red cords, like Baiano Anzol (another formado from Mestre Bimba) and Lua (Lua Rasta) from Salvador street capoeira, as well as Nestor Capoeira and Bermuda, both of whom started capoeira with Mestre Leopoldina, and later they left the group to follow their own ways. Originally the group trained according to the teaching’s of Mestre Bimba but gradually began to incorporate influences from Rio de Janeiro. By this time the group was the premier Capoeira group in Rio de Janeiro and one of the most widely known in the whole of Brazil. In the following years the group grew in size and influenced many other groups in various states. The 12 initial members went in different directions and new mestres were graded. Capoeira also started spreading to the USA and Europe in the early eighties. 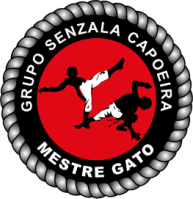 Mestre Gato was the first to introduce Capoeira in the Catholic University of Rio de Janeiro and in the Federal University of Rio de Janeiro, Fundao campus, in 1967 as did other mestres of Senzala, at several other schools, clubs and universities. The mestres of Senzala started to organize national and international meetings, always trying to bring the old mestres to teach the participants. During the eighties the group began to loose it’s cohesion due to the fading of new ideas and excessive expansion. Important members quit the group and went in their own directions. When the situation was realised, the senior members began remedying the position of the group. As the 1980′s drew to a close Group Senzala was again expanding and Capoeira began to be taught world-wide. Group Senzala was one of the strongest organised groups in Brazil and in touch with the velha guarda (old guard) of capoeira. This enabled the group to be in a good position to help in the development of Capoeira outside of Brazil. In 1987, mestres Garrincha, Peixinho, Toni Vargas and the then student Claudio Arruda, spent around 6 months in Europe, taking part in workshops, seminars and demonstrations. They supported some Senzala students who had been teaching capoeira there for a few years, like Claudio Samara in Amsterdam and China in Paris. They helped the organization of the first European Capoeira Meetings in Amsterdam and in Hamburg. Mestre Gato arrived in the UK in 1989 for a year of studies at Newcastle University. He then met Mr. Eamonn Dunlea who led a group of capoeira enthusiasts who Gato started training. This group later affiliated themselves with Group Senzala to became Group Senzala of Great Britain. The Group grew mainly in England with the teachers Lloyds Howell (Carroussel) and Chris To (Sangue Bom) who started taking capoeira classes in Harlow initially , then Cambridge and later Norwich and Leicester. In 1994 Jimmy McAvoy (Taz) started working in Newcastle, Durham and Peterlee. The group in Scotland started in 2000 with the arrival of Mestre Gato’s son, Pedro. Soon regular classes started in Edinburgh, Glasgow and Dundee . In 2006 Pedro moved to teach in Cambridge and Leicester. Since then the Group expanded to other locations in the UK: Grantham, Sheffield, Northampton and Wrexham. There are also centres under Mestre Pedro guidance in the Basque Country, Indonesia and Iran.